A Player's Guide to Conflict, a 32-page full-color introduction to the wonders and hazards of the planes, for DM and player alike. Featuring sites not described elsewhere. Planes of Conflict (1995), by Monte Cook, Dale Donovan, and Colin McComb, is the third of a trilogy of supplements describing the outer planes of the Planescape Campaign Setting. It was published in December 1995. Continuing the Planescape Series. Planes of Conflict marked the end of the second year of Planescape publication. 1995 had seen the release of a total of five setting books, two adventure books, and one Monstrous Compendium supplement. Besides two Planes books, the setting releases also included a trilogy of books about Sigil and the Outlands. It was a marked contrast to year one, which had instead focused on adventures. Where TSR was interested in defining what a Planescape adventure was in its first year, now they were instead laying out the rest of the setting. Planes of Conflict was a close companion to its two predecessors, Planes of Chaos (1994) and Planes of Law (1995), but the format of these boxed sets continued to slightly shift. As ever, this set started off with a player's guide. It also contained four other books: a Monstrous Compendium supplement, an adventure book, and two books describing the planes for GMs — with three adjacent planes described in each book. The box also contained a set of attractive but abstract full-color maps. Expanding Planescape. Planes of Conflict completes the Great Wheel by detailing the last six Outer Planes — the ones lying between Law and Chaos, three toward the side of Good and three toward the side of Evil. All six planes been with D&D since Gary Gygax first laid out his vision of the Great Wheel in The Dragon #8 (July 1977). 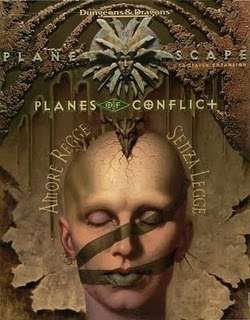 The Planes of Conflict tend to share two characteristics: most were renamed with the publication of the Planescape Campaign Setting (1994) and most were otherwise ignored in earlier D&D products. Beastlands was originally known as the Happy Hunting Grounds, probably based on the mythology of the Great Plains Indians. However, TSR was working hard to get rid of the names of anything from a real religion, so that name was changed in the Planescape Campaign Setting (1994). The plane had previously been featured in "The Hunt" in Well of Worlds (1994). All three layers of the primal wilderness of the Beastlands were now described: Krigala, Brux, and Karasuthra. Bytopia was previously known as Twin Paradises, but was presumably renamed because Paradise sounded like Heaven. Jeff Grubb's Manual of the Planes had already imagined the plane as having two sides that faced each other. Planes of Conflict expanding on that idea by detailing both Dothion and Shurrock; it also stats up the plane's unique adamantite dragon. Carceri was formerly known as Tartarus, where the Titans were imprisoned in Greek mythology. Its new name was an Italian word for prison — an idea that Planes of Conflict generally builds on by making Carceri the "Eternal Prison" of the Outer Planes. Previous to the publication of Planescape, Carceri was best known as the home of the demodands — a race briefly called the gehreleths during AD&D 2e (1989) days. This fiendish race has never been as popular as demons, devils, or even daemons, but has appeared in most editions of D&D and was even featured in Paizo Publishing's Shackled City adventure path (2003-2004). "Hard Time" in Well of Worlds (1994) was the main prior look at the actual plane of Carceri. All six of Carceri's "nested" layers are detailed in Planes of Conflict: Othrys, Cathrys, Minethys, Colothys, Porphatys, and Agathys. Elysium is also drawn from Greek Myth, like Carceri and the Gray Wastes. Despite that, TSR didn't change its name. The plane had received little attention prior to Planescape, but that changed in 1995. "The Deva Spark" (1995) was an adventure partially set in Elysium, while the Blood Wars Card Game (1995) introduced a new angelic race from Elysium, the Guardinals — who then returned in Planescape Monstrous Compendium Appendix II (1995). In Planes of Conflict, the River Oceanus gets some attention, as do all four layers: Amoria, Eronia, Belierin, and Thalasia. Gehenna is the other Plane of Conflict that retained its name, even though it has origins in the Bible. It's best known as the home of the daemons (though they originated in the Gray Wastes and also dwell in Carceri). This fiendish race was created by Gary Gygax for D3: "Vault of the Drow" (1978) and returned in Fiend Folio (1981); their slightly earlier origin may be why they get more respect than the demodands. Following the release of AD&D 2e (1989), the daemons were now called yuoloths. A member of their race had already played a major role in a previous Planescape adventure, "The Deva Spark" (1995). They were also receiving some attention in the Blood War, are mercenaries in its battles. The four "furnaces" of Gehenna are all detailed in Planes of Chaos: Khalas, Chamada, Mungoth, and Krangath. The Gray Waste was originally known as Hades, but changed names with the advent of Planescape. It's called the "battlefield" of the Blood War, which makes sense because it lies halfway between the Abyss and the Nine Hells, in the lower planes. All three of the "glooms" are described here: Oinos, Niflheim, and Pluton. About the Creators. The majority of Planes of Conflict was produced by Donovan and McComb, with Cook writing the monsters. This was one of Donovan's first major contributions to D&D, alongside Player's Option: Skills & Powers (1995). McComb was a more experienced D&D author, with three previous Planescape products to his credit, including Planes of Law (1995). He'd go on to produce some of Planescape's pivotal products in the next two years, often alongside Cook. This really needs a PoD. It's ridiculously expensive on ebay and thus the only box I don't have. If anyone's curious, this appears to be complete. As a matter of fact, I was curious. Thank you for the heads up!